Reading Pulling Up Stakes, I was heartily inspired! Savvy psychologist and ordained Buddhist mindfulness practitioner, Harriet Wrye turns her psychoanalytic lens on herself, her relationships and sculpting a life with purpose and passion. Packing into the wilderness with llamas, leaving her home in the hands of nightmarish house-sitters while travelling through five continents from the depths of the Red Sea, to vanishing tribes in the Amazon rainforest, through New Guinea and Borneo to the high Himalayan plateau while, by the way, navigating breast cancer and a few other challenges. 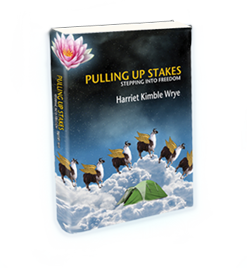 Harriet Kimble Wrye tells true stories of her own extreme sports path to enlightenment. She confronts basic human suffering, ill health and the loss of dear ones, each obstacle an opportunity for personal growth. Her every journey is a spiritual pilgrimage, a fascinating Bildungsroman, a story about â€œComing of a Certain Age.